Amidst Prime Minister Narendra Modi's efforts to make a powerful political impact across India by withdrawing Rs 500 and 1000 notes, ostensibly to fight black money, one Parthesh Patel undertook an interesting Facebook poll, revealing that 54.48% social media users continue to want BJP to rule Gujarat. On the other hand, the poll shows, 40.98% Facebook users want Congress to rule Gujarat, while just about 4.54% want Aam Aadmi Party (AAP) to rule the state. Calling himself to be a “political observer”, Patel says, the Facebook live reactions poll was “an experiment” he had undertaken in order to figure out how many Facebook users would support which party in case the elections happened today. 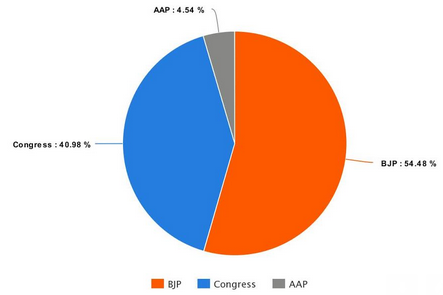 The poll was conducted for three major parties only – Congress, BJP and AAP. The Facebook poll, says Patel, was held to ascertain how the youth would politically react during an election in Gujarat. According to Patel, the poll got shared by over 2,900 people, with more than 50,000 commenting on what they thought of the current political situation. The Facebook “survey” showed that, in all, the BJP polled 29,549 votes, Congress 22,225 votes and AAP 2,467 votes. Interpreting the poll, Patel says, while it is true that the BJP “is connected with the youth”, as is clear from the fact that it got majority of the votes, the fact remains that educated urban people – who cast their votes – consist of BJP and AAP votebank. The youths among them, adds Patel, are particularly active on social media platforms. 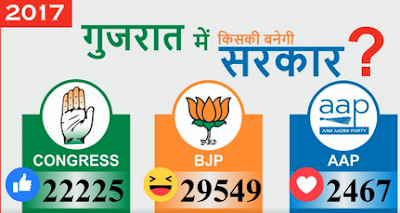 Given this framework, indicates Patel, the very fact that about 41% of the social media users, all of them from the urban areas, supported Congress suggests that the party is showing up. “The result indicates the BJP would lead the governance of Gujarat, but on other hand it can’t be ignored that the Congress still has major chance to lead governance this time in the year 2017, compared to their performance in previous elections of 2007 and 2012”, Patel predicts. Gujarat assembly polls are scheduled for December 2017. The Congress has been receiving around one-third of the total assembly seats, 182, not just in 2007 and 2012 elections, but earlier polls too held during the two decades. Says Patel, these results have come not just against the backdrop of “the shocking move” of Narendra Modi’s government at the centre of not just demonetization but also surgical strike on Pakistan-occupied Kashmir.